I went to the Blueberry Festival in Plymouth, this last Sunday with my daughter, Keri, and our grandsons, Christopher and Nicholas. We took our granddaughter, Naomi, and grandson, Noah, with us as well. 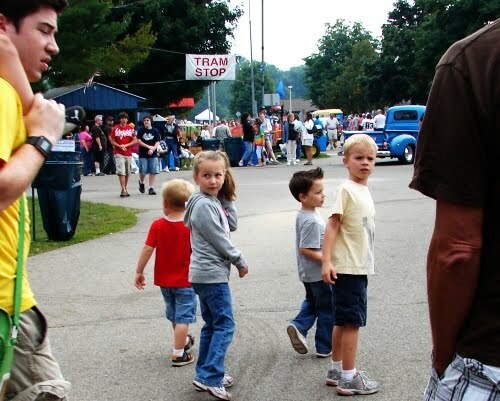 The six of us walked through the festival, while my husband, Fred, and Travis, our son, walked through the Car Show and Swap Meet across the street. Two adult women, with four children. Chris is 7, Naomi is 6, Noah is nearly 5, and Nicholas is nearly 4. And this old mother hen about went crazy trying to keep track of everyone!! At one point, all four grandchildren were holding hands. It was adorable, and they did it on their own without any prompting. But they were so intent on getting to the Kiddie Rides, that they weren’t paying attention and got ahead of us. When I snapped this picture, they suddenly realized Mom and Nana weren’t around! That look on their faces is priceless!! Sometimes He’s smiling, like we were as we watched to see how long it would take them to notice we weren’t there. Sometimes He has to call us back and admonish us, out of love and concern, and remind us He is supposed to be in the lead. The moral of the story? I never have to wonder where God is… because, hopefully, He’s leading the way, and I’m following!! I love this Mid! It is so good to read your stories about life and God…You have such a rich talent!! oooh, this is driving me crazy… dna in indiana?? Don't keep me in suspense… can't figure it out! !